During the FIFA World Cup, you’ll find a new experience for exploring group tables, stats and trending players so you can keep track of the tournament, right on Search. Within 30 minutes of the end of each game, you’ll find video recaps from select broadcasters featuring goals and highlights of major match moments. For each match, you can tap to watch live or follow along with score updates on your phone. You’ll also find a detailed timeline with updates including in-game moments, live images, stats, tweets and more. An example of the timeline you'll see once this year's tournament begins. To keep track of all the matches, even when you’re not searching, you can pin real-time scores on your Android phone screen from Search on mobile browsers or from the Android Google App. Find the match you’re looking for, tap and drag to pin the match anywhere on your screen. An example of pinned matches you can create during the tournament. You can also get in on the action before kick-off by diving into line-ups, news and winning probabilities, which will update once the match gets going. Local broadcasters and national teams will share the latest highlights and updates via Posts on Google. If your country is competing in the tournament, keep an eye out for a Google Doodlefrom a local artist. Football fans in select countries will also have a chance to check out the Doodles, and they will all be available as they are unveiled at google.com/doodles. Keep your eyes on the match and ask your Google Assistant for updates on all the World Cup action. If you want to find out who won the match between Germany and Mexico, which players have scored the most goals in this year’s quest for the Golden Boot, or how many FIFA World Cups Brazil has won, just say “Hey Google” and ask away! You’ll also get fun BTW (by the way) stats for some of your questions, so keep your ears open. Stay on the ball with all the FIFA World Cup action as it happens with a dedicated World Cup Tracker on your Google News app on Android. The tracker will include a special “spotlight” feature that provides an easy way to visualize live scores, highlights, results, and schedules all in one place. 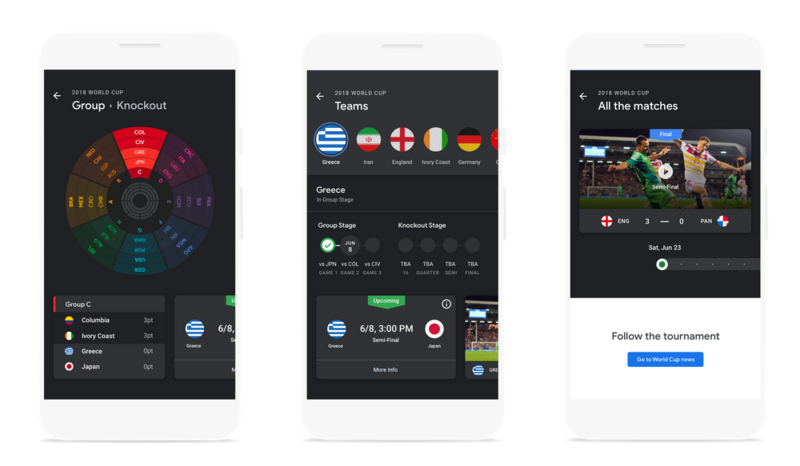 Fans can quickly check on how their favorite teams are performing throughout the tournament and find video highlights to watch on YouTube. The feature will be available for users in the U.S., Germany, France, U.K., Brazil, Mexico, Argentina, Peru, and Colombia. If you want to know which moments popped on the pitch and where fans are teeming with anticipation, head to our Google Trends page for an interactive, real-time view of FIFA World Cup searches. We will have special pages in different languages, in the U.S., France, Germany, U.K., Brazil and many more. Our data will include real-time rankings of the world’s players based on search interest and embeddable maps and charts where you can relive each game through Search, as soon as it happens. Miss a game? Can’t get enough of the action? On YouTube globally, you can catch up on your favorite FIFA World Cup moments with select video highlights from official FIFA broadcasters in more than 80 countries around the world, including from Fox and Telemundo in the U.S., the BBC in the U.K., ARD Sportschau in Germany, NHK in Japan, Kwese in Nigeria and across Africa, Televisa in Mexico, Latina Televisión in Peru, and more. In the U.S., you’ll be able to watch all games live in markets where YouTube TV is available, with the additional option of using the YouTube TV cloud DVR feature to record matches. For more about how to tune in with YouTube, check out our YouTube blog. Starting June 14, look out for the “good for watching sports” highlight on business listings in Google Search and Maps to find your best local places to watch the games. For a little inspiration before you put on your jersey and head out the door, take a closer look at two FIFA World Cup stadiums, Otkrytye Arena and St. Petersburg Stadium, on Street View. 2018 FIFA World Cup Russia™ Official App: A must-have for the tournament, featuring live scores and play highlights, plus lineups, standings, and more. Panini Sticker Album: Whether you traded player stickers on the playground or you’re new to the superfan game, you’ll have a blast with this digital sticker album. Collect stickers from all 32 teams competing in this year’s tournament. Onefootball Live Soccer Scores: A hub for die-hard soccer fans, Onefootball is an excellent source for schedules, live scores, player transfer rumors, and more. Top Eleven 2018 Be a Soccer Manager: Get into the nitty-gritty of club management with Top Eleven as you focus instead on managing virtually every other aspect of your burgeoning football club. Now let’s start the countdown to kick-off!